Sometimes new friendships are forged from the unlikeliest of circumstances. That has been the theme of the week here in the Our Everyday Harvest household as my son and I have been enjoying a new book, Flash the Donkey Makes New Friends. Hee-haw! A stray donkey with a penchant for inventions is taken in by a mismatched collection of barnyard friends. 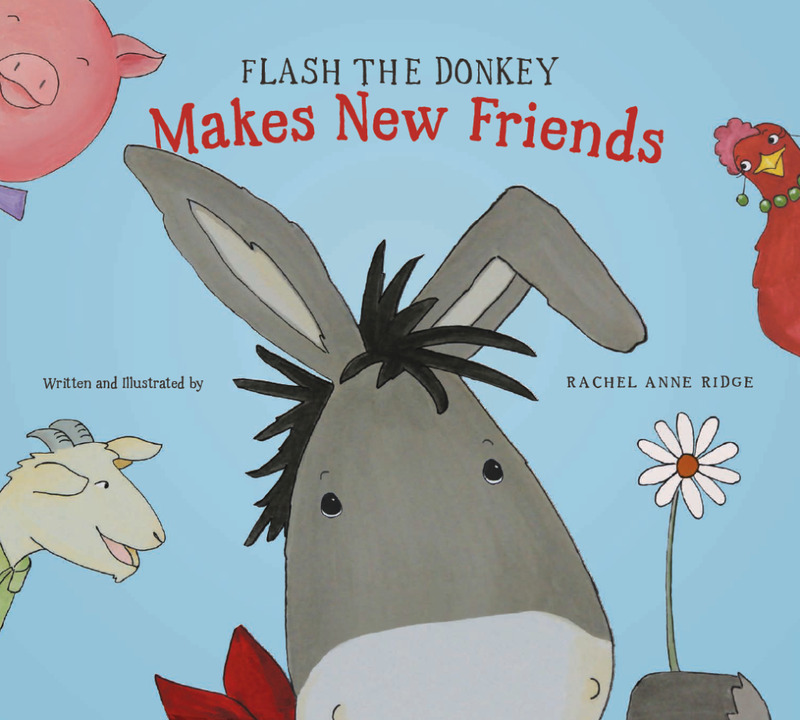 Flash the Donkey Makes New Friends is the heartwarming story of a not-so-ordinary donkey who needs a special place to belong. Flash is the inquisitive type who loves to invent things and solve problems, but his curiosity sometimes gets him into trouble! With the help of his new-found friends—Jed the Goat, Carson the Pig, and Ruby the Chicken—Flash manages to turn problems into adventures and learns valuable lessons along the way. While tole-painting Christmas gifts one year, Rachel Anne Ridge discovered a love for art, and inadvertently launched a new career. In 1999, she took her paint brushes and began creating murals and faux finishes in the booming Dallas Fort Worth area. When the small business started growing, her husband, Tom, joined her. Together, they have expanded it into a large-scale corporate art, graphic design, way-finding, and custom artwork company. Along the way, they raised three children, journeyed through loss, failures, and successes, and adopted astray donkey who showed up on their doorstep and never left. The story opens up with a donkey who will soon come to be known as "Flash." It's evident that Flash doesn't have a place to call home–in the beginning of the story he doesn't even have a name. Traveling from area to area he fills his wagon up with items he finds along the way. After a small accident, he is taken in and cared for by Jed the Goat, Carson the Pig, and Ruby the Chicken. Soon the tables turn and Jed, Carson, and Ruby run into a predicament of their own. In return for their act of kindness to him, Flash is now able to help them with their troubles. This is a lovely picture book with delightful artwork done by the author, herself. The story is as precious as can be. As soon as I finished reading this to my son, I couldn't wait to read it all over again. The message conveyed is so moving, there's no way this could not make an impact on your heart. When I discovered the inspiration behind this book, it made me love it even more. You see one day author, Rachel Ann Ridge, had discovered a wounded donkey standing in her driveway. She adopted him, and gave him the name "Flash." This chance encounter actually changed lives of both her and her family. 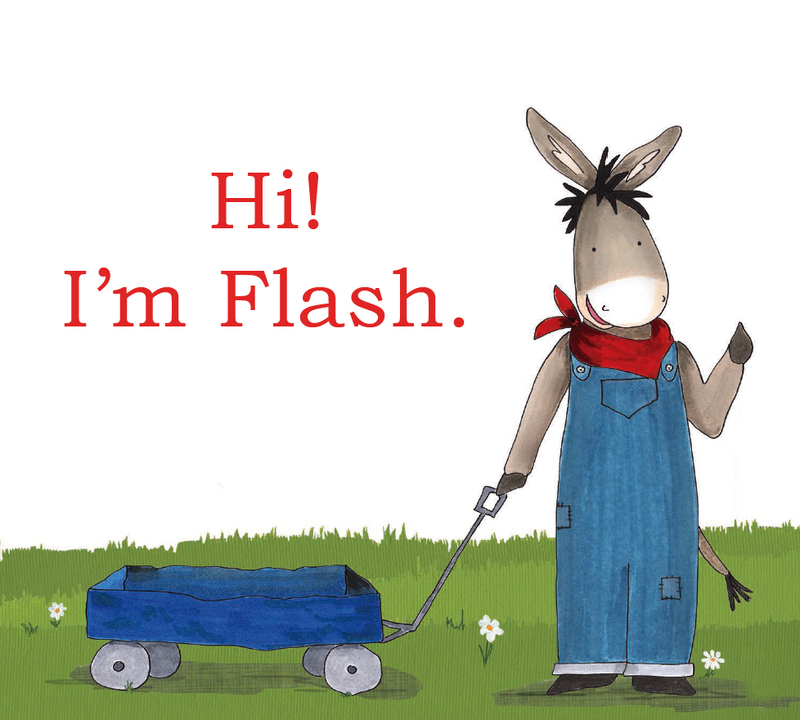 She actually tells the entire story in a book that was previously released, Flash: The Homeless Donkey Who Taught Me about Life, Faith, and Second Chances. I have yet to read that book, but it sounds like such a heartwarming story, I've already added it to my reading wish list. Flash the Donkey Makes New Friends is a sweet story that's sure to make an impact on any child's heart. Kids will not only delight in the story and it's illustrations, but learn a very important lesson on the value of friendship and good deeds. Be sure to also head on over to the author's website where she's offering free kid's printable activity pages, including coloring pages, crafts, and journaling and more!